W.C. Fields is a true comedy legend and remains one of the most recognizable and beloved actors of all time. From his early days on stage in vaudeville and Broadway through his live appearances on radio, he created an iconic persona that has never been matched. The comic genius of W.C. Fields is best captured forever in his body of films that highlight his notoriously sarcastic quick wit and slapstick routines. 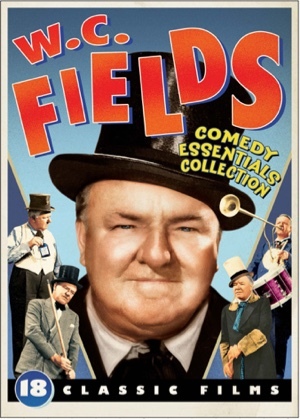 The W.C. Fields: Comedy Essentials Collection features 18 of his best feature-length comedies that continue to leave audiences of all ages laughing out loud. “The Juggling Scene” from The Old Fashioned Way (1934). “The Ping Pong Match” from You Can’t Cheat An Honest Man (1939). “The Cigar Box Fiddle” from Poppy (1936). “Honest John” from Six of a Kind (1934). “Diner Scene” from Never Give A Sucker An Even Break (1941). Home Movie from the Broadway theatre to home in Great Neck, NY, 1920's. Long before the Tony Award winning The Book of Mormon, there was The Mormon’s Prayers on Broadway. Never before in the history of Broadway did a star’s name appear above the producer’s. But in 1928, on the marquee W.C. Fields' name appeared above Earl Carroll’s Vanities. W.C. Fields respected the works of Charles Dickens so much that he did not change or ad lib any words in The Personal History, Adventures, Experience, & Observation of David Copperfield the Younger. “Now and Forever” from David Copperfield (1935). Trailer for David Copperfield (1935). “Mr. Muckle” from It's a Gift (1934). “Out on the Porch” from It's a Gift (1934). Golfing great Bobby Jones consoling W.C. Fields on his poor golf swing. “A Veritable Tiger” from The Golf Specialist (1930). “The Sheriff Tends Bar” from My Little Chickadee (1940). The Fatal Glass of Beer (1933). Content rights © 2017 Harriet A. Fields. All rights reserved.